Features of the on-board electrical system for Model 230 has a two-battery electrical system, consisting of a starter battery (G1/4) in the engine compartment and an on-board electrical system battery (G1) in the trunk. The task of the starter battery (G1/4) in normal operation is to provide the energy required for the starting procedure. The on-board electrical system battery (G1) supplies all the electrical consumers in the vehicle, even when the vehicle is idle. 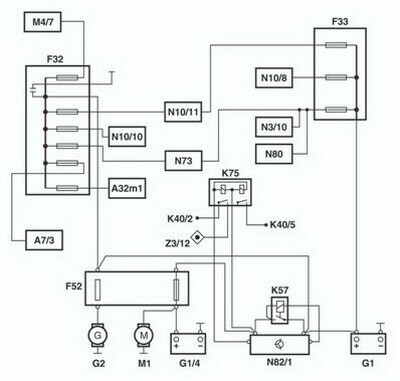 The separation of the on-board electrical system into a starter battery circuit and an on-board electrical system battery circuit serves to preserve the starting ability of the vehicle. The on-board electrical system in model 230 is managed by the battery control unit (N82/1). It uses the measured voltage and temperature values to evaluate the state of the battery and initiates measures to stabilize the on-board electrical system if necessary (e.g. consumer shutoff). The on-board electrical system battery (G1) is located under the spare tire cover on the right. The starter battery (G1/4) is located at the rear of the engine compartment on the right in front of the firewall. • Check condition of on-board electrical system battery (G1). • Connect positive clip (1) of charger to positive terminal of on-board electrical system battery (G1). • Connect negative clip (2) of charger to negative terminal of on-board electrical system battery (G1). 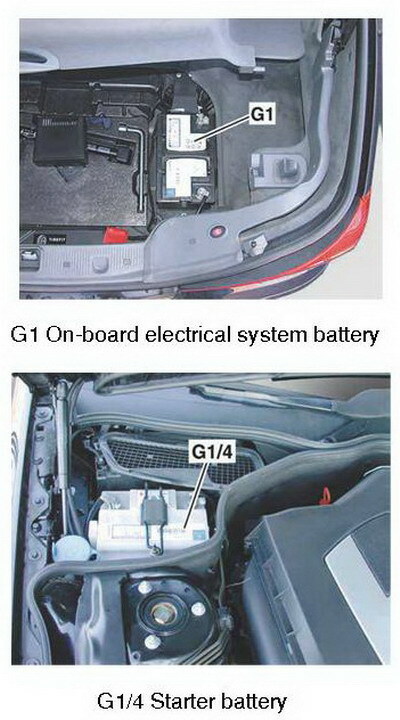 • Charge on-board electrical system battery (G1). • Check condition of starter battery (G1/4). • Connect positive clip (1) of charger to positive terminal of starter battery (G1/4). • Connect negative clip (2) of charger to negative terminal of starter battery (G1/4). • Charge starter battery (G1/4). Recharging occurs with current and voltage regulation (U = 13.5...16.6 V). The charging current is limited to max. 15 A. The charging time depends on the battery temperature (calculated from outside temperature and engine temperature) and lies in the range of 12....180 min. • Connect positive clip (1) to positive terminal of starter battery (G1/4). • Connect negative clip (2) to body or engine ground (e.g. engine block lifting lug). • In vehicles with TELE AID (code 855), set the TELE AID to Service mode. • In vehicles with Keyless Go (code 889), press the Keyless Go start/stop button (S2/3) repeatedly until the ignition is switched off. Remove the transmitter key (A8/1) from the vehicle and keep it outside the range of the transmitter (at least 2 m). • Switch off ignition and switch off all electrical consumers. • Remove transmitter key (A8/1) from EIS [EZS] control unit (N73). • Disconnect ground line of on-board electrical system battery (G1) and protect it against unintentional contact. • Disconnect positive line of on-board electrical system battery (G1). • Remove on-board electrical system battery (G1). After removal/installation of the on-board electrical system battery (G1) basic programming (normalization) of the vehicle is required. Read out the fault memory and erase if necessary (up to 14.1.04). • Disconnect ground line of starter battery (G1/4) and protect it against unintentional contact. • Disconnect positive line of starter battery (G1/4). • Remove starter battery (G1/4). After removal/installation of the starter battery (G1/4) basic programming (normalization) of the vehicle is required. 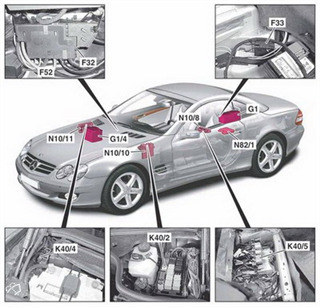 In this section we add some useful information about some Mercedes Benz 230 Battery System and it features.